Storm damage, pebbles flung from a lawnmower and holes cut to install wiring are only three of the reasons you may need to patch your home's vinyl siding. Specialty caulk products, tinted to match common vinyl siding colors, come in handy for small repairs, or you can use paintable caulk and match the vinyl's hue with paint. Larger repairs require a bit more work or even a complete replacement of the damaged piece. You can mend small holes such as nail holes with exterior caulk designed to stick to vinyl. Fill in the hole with a tinted caulk that matches your siding, or opt for a paintable version. Squirt the caulk into the hole so it fills the area behind the siding, until it sticks out just a little from the front of the hole. Allow it to cure for several days or as recommended on the caulk packaging. Once the caulk firms up, slice the excess away with a utility knife or razor blade so it rests flush against the siding. Holes an inch or two across -- or long, narrow holes that still appear patchable -- require removing the damaged piece of vinyl to fix it. A siding zip tool pops the piece off from the bottom edge. Cover the hole from the back side with foil tape, then put the siding back where it belongs. Spread a thin layer of tinted caulk over the exposed foil tape, or paint the caulk to match the siding once the caulk dries. Covering the damage with a fresh piece of vinyl siding is one way to cover a large hole if you don't want to replace the old piece entirely. Cut a new piece of siding long enough to cover the damage -- the longer it is, the less obvious the repair since the seams are farther away on a long piece. Cut the nailing strip off the top of the new piece with a utility knife. You may have to trim the curved bottom lip off as well; hold the piece up over the damaged section to determine whether the second cut is necessary. Secure the new piece over the old with construction adhesive. 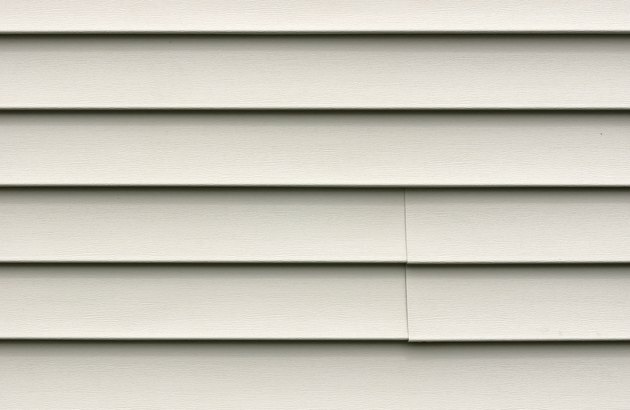 Tinted siding caulk is a specialty product generally not offered at home improvement or hardware stores. Siding wholesalers and contractor-supply outlets may have the tint you need to match your siding, especially if you know the manufacturer and color name of the siding. A siding zip tool, used to remove the siding, is available from home improvement stores. Replacement siding matching yours may be available from a siding contractor or the manufacturer, especially if the siding is relatively new. Check around in a garage or storage area to see if you have any siding pieces left over from the original installation.